Many VR owners face the problem of renters setting the thermostats too high or too low. Not only does this have a significant cost associated with it from excessive energy use, but it can also damage HVAC equipment. In the case of Air Conditioning, many people simply don’t understand how cooling systems work. They mistakenly believe that setting the thermostat lower, say to 62 degrees, will make the AC system blow colder air and cool the house faster. What people fail to recognize is that Air Conditioners don’t have different temperature settings. Cooling is either ON or OFF. The temperature set on the thermostat is simply a switch that tells the Air Conditioning unit to “run until the air temperature reaches X”. So when a guest sets the thermostat to 62 degrees, the AC system is going to run until it hits that temperature. The problem is most systems can only cool a home to a certain point below the outside temperature. Often, 62 degrees is impossible to achieve and the system will run non-stop trying to achieve the impossible. What results is an ice build up on the cooling coils and the inevitable forced shutdown of the system. When this happens, the air conditioner stops working and the home starts to heat back up. This is when you get a call that “the AC isn’t working”. Best case scenario, as the unit thaws it will start working again, but in many cases this can cause actual damage to the equipment. Either way, setting temperatures above or below a certain level should be avoided. 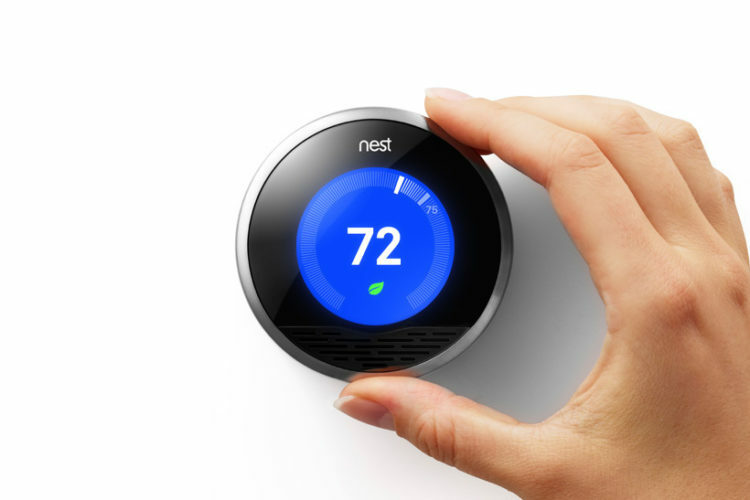 Many Thermostats like Google’s Nest, have ‘locks’ built in that prevent guests from setting temperatures outside of a permitted range. This works well, except for cases where the thermostat needs to be used in Heat+Cool mode such as Spring and Fall when temps at night might be cool requiring heat and daytime temps may be hot enough to require cooling. 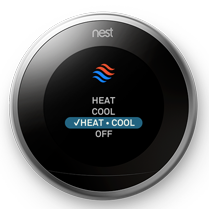 Nest simply doesn’t allow for “locks” in Heat+Cool mode, only in Heat mode or Cool mode. One solution to this problem is to use IFTTT. For those who don’t know, IFTTT stands for “If THIS, then THAT”. Basically it is a FREE web & app based service that allows you to use little pre-made programs based on certain “triggers”. It is VERY easy to use. Nest has a limited number of “triggers” that you can use to take actions. There are literally 4 triggers you can use, Temp rises above, Temp drops below, Nest set to Home, Nest set to Away. There is no trigger that someone has SET the Nest to a certain temp, only that the air temp has crossed a certain level. So that leaves using an imperfect workaround, but it should suffice until Nest hopefully adds ‘lock’ to Heat+Cool mode. 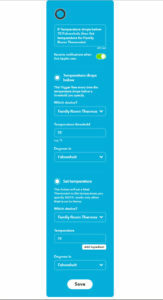 These applets are pre-set so all you have to do is add them to your account and select the thermostat and the temperature and hit Save. It really is that easy. Option A is you can set up an applet that will simply notify you that the temperature went below or above a certain threshold. You set an IFTTT applet that says “If temp drops below 68, notify me”. What this will do, is if someone sets it to 62…..as soon as it hits 67, you get a notification on your phone from the IFTTT app that the temp is below 68. Then you could manually adjust the temperature and notify the guest that temps cannot be set below 68 degrees. 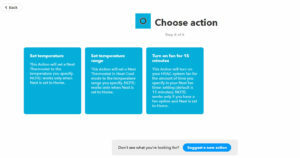 Option B allows you to automate the process.So, if you wanted to make sure that no guests can set the AC colder than 68, you set an IFTTT applet that says “If temp drops below 68, set thermostat to 68”. What this will do, is if someone sets it to 62…..as soon as it hits 67, IFTTT will re-set the thermostat to 68. You can also have it choose to notify you that the applet ran because the temp dropped below 68. Here’s a little walk-through of setting up one of these “applets” so you can see how simple it really is. Once you’ve signed up for a FREE account on IFTTT you simply start by entering “Nest” in the search box. Then, choose the “trigger” for “temperature drops below”. Select the thermostat you want to monitor/control. Then tell IFTTT what to set the temperature to if it gets too low. When you are done, here’s what the completed “applet” looks like. You can edit it at any time and you can choose whether or not you want to be notified every time this event is triggered by a temperature drop. There’s also a very basic trigger that will simply notify you if the temperature drops/rises above your set limits. You could then manually go into your Nest app and adjust the temperature yourself. You could also take this opportunity to educate your guests about safe use of the HVAC system. In the end, it is a pretty cool way to automate a workaround to a missing feature in the Nest thermostat. There are a seemingly endless number of other “automations” you can implement using IFTTT depending on what other “smart appliances” you own. You can set triggers to turn on/off lights based on Nest Home/Away modes, turn off cameras based on date/times, and many more. 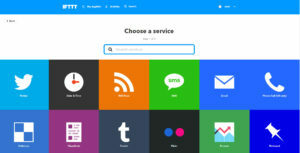 Take a few minutes to poke around on www.ifttt.com and see for yourself. There are thousands of “applets” already written that you can use even if you are a “tech novice”.